'NSG Academy is the pioneer institution in exclusive coaching for all subjects for BCS /BCA (Science) / BBA-CA and helping students on complete personal basis, with a 13+years of fruitful experience. NSG academy provides comprehensive and result oriented coaching for BCS / BBA-CA / BCA (SCIENCE) by experienced and knowledgeable faculty members. 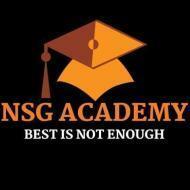 NSG Academy stands at high position by producing Top Rankers consistently in BCS / BCA, in a very short span of time. We, NSG Academy believe in the principle of well-planned studies and giving proper & complete guidance of all the core Computer Science & Engineering Subjects. Teaching is our Passion and Knowledge is our power. "I got the best coaching institute for computer science.The trainers are well experienced and supportive.The atmosphere is very good." "NSG Academy is one of the best institute in pune.The classes are very good.Here you learn more than what textbooks offer." Suresh Agrawal conducts classes in BCA Tuition, BSc Tuition and Engineering Entrance Coaching. It is located in Sadashiv Peth, Pune. It takes Regular Classes- at the Institute. It has got 2 reviews till now with 100% positive feedback.